Nikulin's “Golden Circus” in Vladivostok. 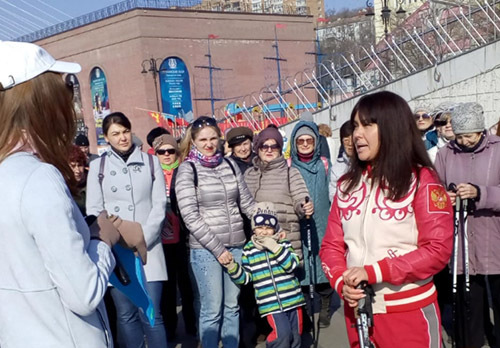 Famous Moscow artists brought their best numbers to Primorye. The most interesting is a unique representation of the illusionists of the Falcon dynasty. Aerial gymnast Margarita Chomakhidze is flying right under the dome. A fragile girl performs incredible stunts at a height of 20 meters. The artists work without insurance in the height of the 14-storey building. Accompany each number splashes of water, flashes of fire and light show. Appears on the arena and favorites of the public - tailed and feathered artists. "The show of water, fire and light" completes the tour in Vladivostok. This week, titled artists give the last two performances in the capital of Primorye. 16.05.2018 Young circus from Arsenyev are the road of dreams. 09.11.2016 210-metre-high skyscraper will be built in Far East of Russia.